the best icebreaker ideas: how to play! Free Instructions (step-by-step) for good icebreaker ideas! You will find over 100+ of our favorite family friendly icebreakers and group activities. These easy-to-follow guides are useful for a wide variety of settings: classrooms, corporate training and team building, camps, youth groups, parties, retreats, hanging out with friends! Please share this site with your friends! Below, you can find them sorted by your group size (small, medium, large and extra large) and by type (active, get-to-know-you, team building, party game, etc.). All step-by-step instruction guides on this website are totally free! But if you prefer to have a printable PDF eBook version of the games collection (with no ads! ), you can download it instantly for $5.99. 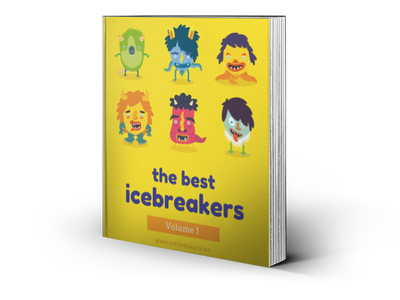 See our complete collection of all icebreaker games. Action packed activities that might cause you to break a sweat! Activities for your next shindig (more good party games here). Icebreakers that help people get to know each other. Icebreakers for teachers and students. Don’t forget to share this website with your friends. Also check out our friends educational game design and great group games.